Behind the former city wall arches at Strausbourg and St-Denis sits a vibrant Arab and Indian community. You’ll find a wide assortment of places to eat from the simple street vendors to elegant restaurants. Le Bec Fin is a traditional couscous restaurant with a beautiful interior, fresh food and reasonable prices. The first thing you’ll notice at Le Bec Fin is the tile work. It’s fantastic and you’ll think you’ve been transported to Algiers. The restaurant is a beautiful place to visit. The service is friendly and the waiter spoke perfect English. 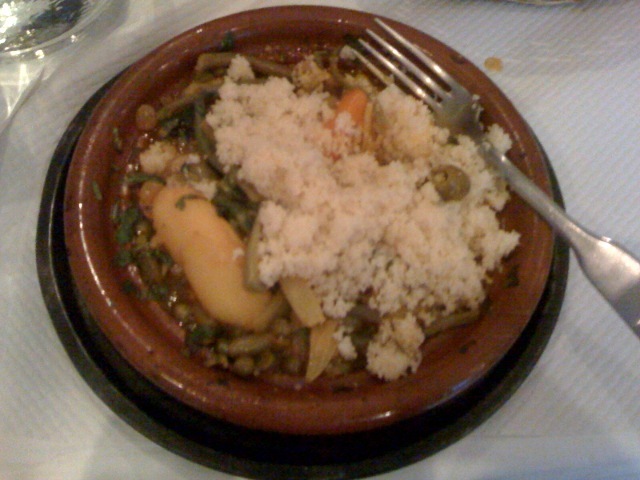 Le Bec Fin specializes in couscous and tangines. I chose the vegetarian tangine. I’ve always wanted to see what this form of cooking produced. At first, I thought the plate served was a bit small, but it was a perfect amount when the fluffy couscous arrived at the table. The food is very fresh and carefully prepared. My friend had the Algerian wine, but thought a traditional french wine would have been sufficient (and cheaper). Le Bec Fin is very close to the Strausborg arch. Just look for the restaurant with the gleaming tile interior. It’s a nice place for dinner. Ask me for a good taco shop in California and I’ll point to the one that has 15 layers of glossy orange and yellow paint encrusted on the walls. Within those coats of paint could be remnants of tacos, cockroaches, and who knows what else. In short, I’m not afraid of a restaurant with questionable hygiene. “It adds protein” is my standard reply to the occasional hair or fly. Dirty restaurants do not make the food better, it’s just part of the taco shop environment in Southern California. Clean taco shops usually sell “healthy” burritos and who wants that? I discovered Passage Brady in Paris recently. It’s not far from Strasbourg St. Denis, tucked between streets filled with Turkish kabob stands. This covered, narrow alley is the closest I’ve seen to “Little India” in Paris. I’m a huge Indian food fan and was looking forward to eating an authentic dish. This has been hard to find in Paris; could England actually make something tastier than the French? Let me set the scene for Passage Brady. 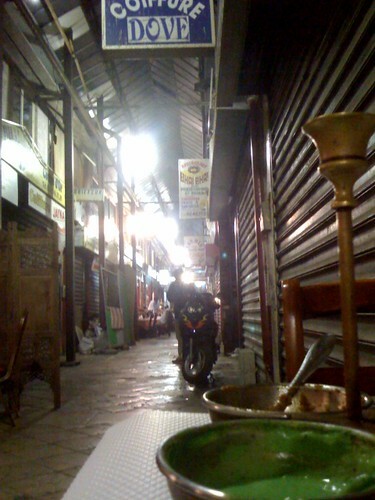 At night, the majority of the shop fronts are closed and small restaurants light up the street. It’s narrow, with a fairly high glass ceiling. It’s dirty but not stinky. In some ways, it reminds me of Tijuana, Mexico; when you move off of Avenida Revolucion. The Indian restaurants all look pretty similar. Some are larger and have more clients, others resemble street-side joints. It had a prominent sign advertising vegetarian Thali. It had a sign saying it won some kind of Indian cuisine award. 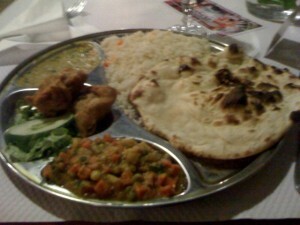 I didn’t need to see a menu, as I knew that I wanted the Thali (a selection of curry, vegetables, rice, and naan). These usually give the restaurant the opportunity to specialize in regional dishes, they are inexpensive, and tasty (emphasis on “usually”). The thali had the standard ingredients. The naan was ok, the rice was good, the vegetable korma was forgettable, the samosa and fried dumpling were good, and the curry was mediocre. I asked for a carafe of water and was nicely surprised to see a sprig of mint in the glass. Overall, the food was average. It wasn’t bad, but not worth the 12 euros. I could get a better meal for that price at many other places. So, why does this restaurant stand out and deserve mentioning on this site? I’ve eaten at many mediocre places and haven’t bothered to highlight them. The memorable part of the meal was not the restaurant, but the passage. A pigeon began flying over my head about five minutes after I sat down. Pigeon poop, feathers, and dust is part of nature, but what would it do for the water and food about to arrive. I watched one feather slowly float from the glass ceiling towards my table. A breeze luckily pushed it away when it began hovering 5 feet above the water glass. Yummy…fun to watch…I’m game so far. I survived the pigeon unscathed and began relaxing. The food arrived a few minutes later and I began sizing up the dish and taking the requisite photographs. Just then, an enormous rat ran from one side of the passage to a pile of garbage on the other side. This rat was huge and was on a mission. His path was about 5 meters from my table. Far enough to not have to lift my legs and scream like a child, but close enough to get a really good view. Pigeons flying and rats running; Passage Brady is going to be an adventure alright. Unfortunately, it doesn’t stop there. I don’t know what the rat was doing, but the garbage heap became a cacophony of rat squealing for the next 30 minutes or until I finished the meal and left. I’d like to think the rat found a friend and enjoyed the romantic atmosphere of Paris. I couldn’t help worrying that my little buddy had ended up on the wrong side of a trap and was not screaming out of pleasure. Either way, my little Indian Thali was more of an Indian Therror! Naturally, I photographed everything and sent emails to friends describing the scene and wondered if I’d meet the Paris/Indian equivalent of Montezuma’s Revenge. I declined the waiter’s invitation for coffee or dessert. No thank you, I think I’m ready for the road. Passage Brady looks like it has some nicer restaurants. Reine du Kashmir was a mediocre place and wasn’t particularly affordable. Every restaurant area in Paris has rat problems, so I don’t hold that against the place. However, it would be nice if the shop owners didn’t leave stacks of garbage in this tiny passage. I won’t be returning to this restaurant, but I might try another venue in the future. 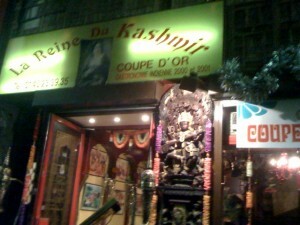 One of these days I’ll find a really good, authentic Indian restaurant in Paris. It will feature a wide selection of vegetarian cuisine, no beef, and lots of flavor. Do you know of a place? If so, leave a comment.